Miss Sydney Hopson will join us February 3rd at 1pm to present her program. 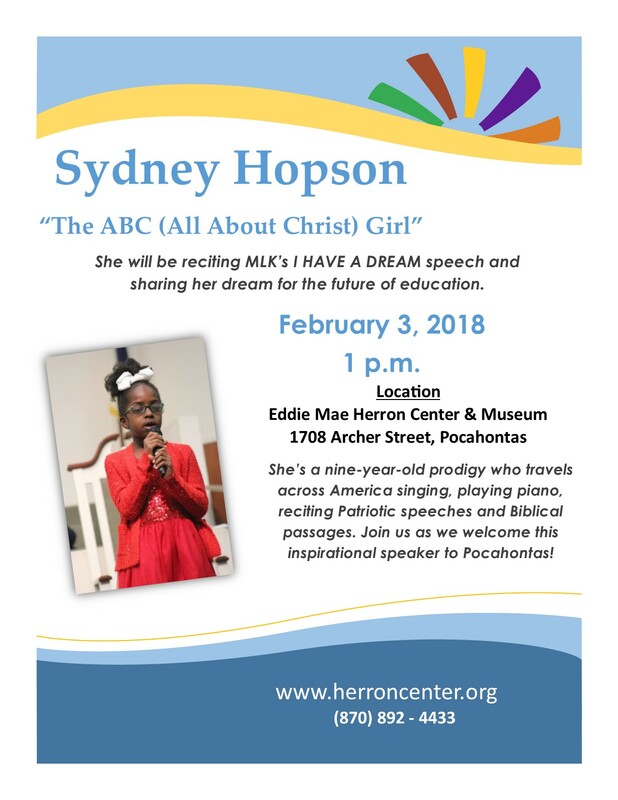 Nine year old Sydney Hopson, commonly referred to as the ABC (All aBout Christ) Girl, continues to travel the Southern region of the United States of America singing, playing piano, and reciting memorized Biblical passages and patriotic speeches. And her family is thankful for all the support throughout Hopson’s 4 year performance journey! Sydney diligently seeks to carry out the unique assignment on her life. Sydney celebrated the release of her first DVD entitled Created to Worship October 2017 with Bell Productions of Conway, AR. Sydney signed with the Donna Groff Modeling and Talent Agency of Actors, Models, and Talent for Christ (AMTC) and will represent Arkansas in the Midsouth Talent Showcase this year. Without the support of so many wonderful people, Sydney’s Grandmother says the traveling ministry would not have become what it has to date. Other talented guests, such as 7 year old D’Asia Eason, will join Sydney in the February 3rd celebration. Eason is a student at Forrest Park School in Little Rock, Ar. D’Asia will render an opening song during the program. D’Asia is the daughter of Marcia Moore and DeAndre Eason. Sydney has been the recipient of numerous types of awards and recognitions from individuals, churches, institutions, and governmental agencies who have shown considerable support over the years to Sydney and her mission for Christ and as a youth ambassador. Sydney is a member of Greater Friendship M.B. Church in Conway, AR, Pastor Houston White. She participates in supplemental studies at New Life Church as her schedule permits. Sydney participates in fundraisers and volunteers in civic causes, especially those directly benefitting kids. Sydney continues to make the Principal’s list with all A’s in her classes. She is in Mrs. Landers 3rd grade class at Conway Christian School. One of Sydney’s long range goals is to possibly serve her country as the 53rd President of the USA. Before becoming President; however, Sydney thinks she may like to be a nurse practitioner, scientist, or doctor, and professional performing artist. Sydney developed interest in politics after discussions with her peers at school about the 2016 Presidential election, after speaking at Democratic functions, after attending political meetings, after knocking on doors and distributing campaign literature on behalf of candidates and composing a fundraising song about Hillary Clinton on You Tube. Sydney pays close attention to CNN political News. Sydney has her initial agenda for her anticipated campaign which addresses kid’s hunger and homelessness, and immigration. This past summer Sydney completed the UAMS Center for Diversity Affair’s inaugural Jr. STEM Academy in Little Rock prior to leaving for summer visitation with her Dad. Sydney also participated in the Kenneth L. Robinson Quartet and Singing Convention in July. 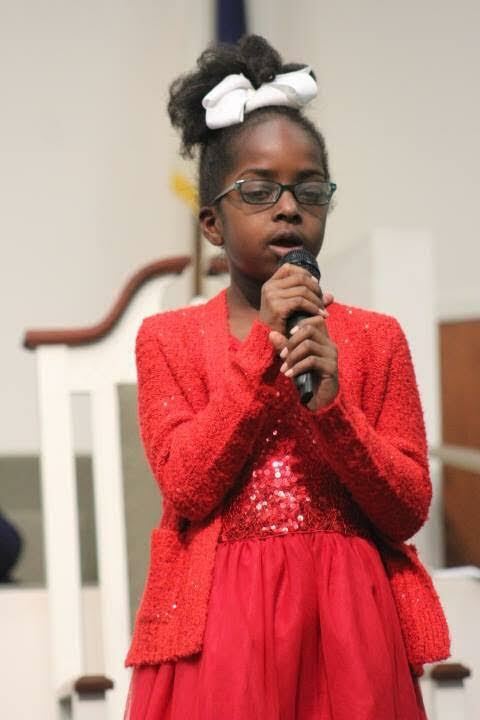 After a stand up reception of applause and Amens from the church filled audience, judges, and promoters, ABC Girl Sydney Hopson was invited to open up for the finale sold out night of the Bishop Kenneth L. Robinson Singing and Quartet Convention at St. Luke Missionary Baptist Church in North Little Rock, AR. Hopson is no stranger to Quartet Conventions as she was named the winner of the 15th Annual National Exclesisa Gospel Showcase Extravaganza held in West Memphis, AR, March 2016. And during its 2017 Annual Extravaganza, organizers Ester Wooten and Harvey Watkins, Jr. along with Bishop Neal Roberson presented Sydney an Outstanding Youth Achievement Award. From that national appearance, Sydney was named on the front cover of Joint Heirs Magazine. The full story, entitled And A Child Shall Lead Them appears in the Fall/Winter issue of the Magazine and can be accessed through Amazon.com. Grandmother Rene Henderson says “She is a blessed little girl. She’s been able to go places and meet people I never would have imagined largely because of her God given gifts and talents and also because of the people who afford her the opportunities”. Repeatedly, Henderson references the role Conway Christian School and area churches and clergy have in Sydney’s spiritual growth and development. And though the achievements and accolades continue to pour in, Sydney remains humble, grateful, and focused. Grandma Rene says she notices Syd’s math skills have sharpened as she counts her money received from donations and engagements and as she subtracts her expenses to arrive at her balances. Because she requires a chaperone for all appearances, Sydney is awed when her Grandmother reminds her to subtract twice for items such as airplane tickets and meals. When Grandma Rene is asked which of the many events and milestones Sydney participated in does she most remember, Grandma says her September 2016 Baptism which aired on Fox 16, her recital for Arkansas Matriarch Annie Abrams 85th birthday celebration in Washington, DC on the same day the Smithsonian’s African American History and Culture Museum opened, and when the School of Religious Study conferred upon Sydney the Exceptional Youth Award, the youngest recipient ever in the history of the program. She had to be picked up to the microphone to give her acceptance speech. call 501.697.3346, email abcgrandma@gmail.com or Facebook Rene Henderson. Interested persons may get copies of her DVD or interactive biographical book entitled God Made MeWho I Am at any of her performances or by contacting her Grandmother, Arkansas Talks PR Manager Patricia Rogers-Ward. Hopson is the daughter of Travis Hopson and Trina Moore.